Michelle Obama has finally revealed what was inside the blue Tiffany & Co. gift box she received from Melania Trump on Inauguration Day. "It was a lovely frame," Obama told Ellen DeGeneres in her first TV interview since leaving the White House. The former first lady stopped by the “The Ellen DeGeneres Show” to help the beloved host kick off a two-day celebration of her 60th birthday. In a sneak preview of the interview, set to air Thursday, Obama also explained what happened with the infamously awkward gift exchange on the White House steps. Hours before Donald Trump took the oath of office, he and Mrs. Trump joined the Obamas for tea at the White House. Upon their arrival, the soon-to-be first lady presented Mrs. Obama with a Tiffany gift box tied in a white satin ribbon. The exchange unfolded live on television, with Mrs. Obama seeming at the moment not quite sure what to do with the gift as the group prepared for a photo op just outside the White House doors. 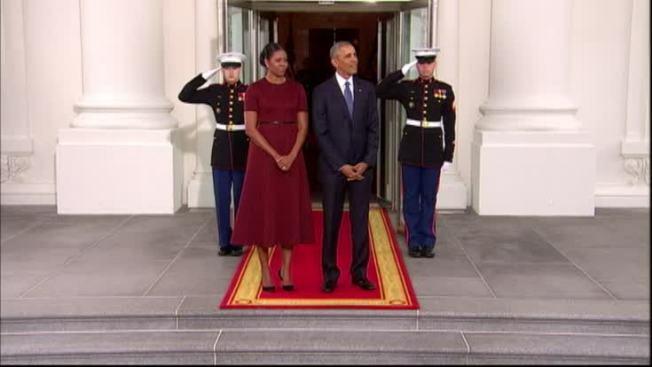 President Barack Obama came to the rescue of his wife, grabbing the gift and taking it inside. Check out more of Michelle Obama's interview with Ellen DeGeneres on Thursday, Feb. 1 at 3 p.m. EST on NBC.